The cover of the May, 1954 issue of Galaxy Science Fiction is by Ed Emshwiller, specifically for Theodore Sturgeon’s story “Granny Won’t Knit.” I’ve only noticed a few covers in these early issues that are illustrations of the fiction within. More often, Editor H.L. Gold seemed to prefer unrelated covers for his magazine. 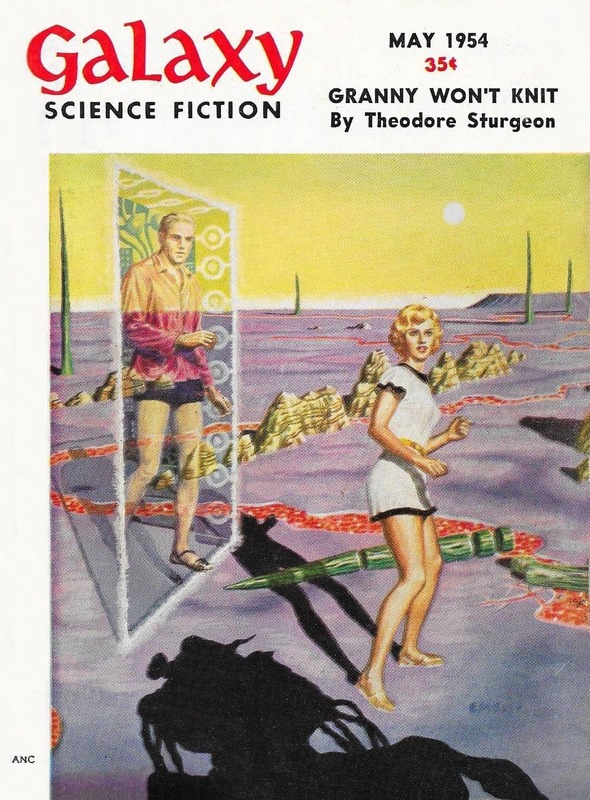 “Granny Won’t Knit” by Theodore Sturgeon — Roan works for his father, who runs a transportation company. Their society has strict rules around proper dress — hiding the bodies and hands of men and women. Families are organized into strict patriarchal units. Though he’s an adult, Roan hasn’t earned the right to begin his own family and remains under the guidance of his overbearing father. Seemingly by accident, Roan transports himself into the presence of a young woman who has bare arms and hands. She teases him a bit as he flounders to leave. But in the days to follow, he can’t get her out of his mind and is determined to find her again. Roan also draws closer to his grandmother, who remembers a culture no one speaks of. And she’s not convinced that the current technology for transportation is the best, considering its limitations to the planet Earth. Her strange views are unsettling, yet Roan sees reason in her thoughts and allows that he may be limited in knowledge. I think this story stands the test of time. There’s not much that glaringly sticks out to make it a 1950s science-fiction story — at least nothing that comes to mind. It works well. “Back to Julie” by Richard Wilson — Hector slips to another dimension for a crooked District Attorney who plans to become governor and eventually president. In the alternate Earth, scientists created and released a truth serum into the air that permanently affects all people forever — forcing them to tell the truth. It doesn’t affect Hector because he’s of another dimension, so he uses his guile to learn the formula. He plans on developing a version that would affect people in his home dimension along with an antidote for the District Attorney, which would give him an edge in politics. What happens past that point doesn’t matter as much to Hector because he has plans of his own. I like the way Wilson wrote of alternate universes/dimensions. And I think the idea of a truth serum for everyone but one person has dire implications. But it all felt a bit too lighthearted for me. “Mate in Two Moves” by Winston Marks — Dr. Sylvester Murt and his assistant, Dr. Phyllis Sutton, discover a viral infection spreading worldwide. The virus causes uncontrollable infatuation between people, leading to widespread absenteeism, absentmindedness, insomnia, and depression. The two doctors race to discover a cure, even as they find themselves infected and infatuated with one another. This is a really cute story. Yes, you can see the ending coming a mile away, but I’m a sap for the occasional tale of romance. And what better romance than between two learned, introverted scientists who are trying to find a solution to an immense problem while also trying not to give in to their viral-induced feelings for one another? Poke fun at me in the comments below; it’s fine. “Open Warfare” by James E. Gunn — Jim Pearson is vying to win the U.S. Open this year. He’s had a decent professional career, though emotions sometimes rattle him, costing him titles. He’s in love with a young woman named Alice, but her rich father hates him. Her father doesn’t think Jim will ever amount to much, only earning thousands of dollars as a top professional in comparison to the millions he makes as a businessman. So he challenges Jim — that if he can earn $50,000 in a single year, he’ll allow Jim to court his daughter. Jim’s year has gone well, but the only way he can cross the mark of $50,000 is to win the U.S. Open. And his biggest challenger is a silent man Alice’s father brought in — a man with skill and precision unlike anyone else… because he isn’t like anyone else. Sports fiction was once a huge genre in short fiction, and it still crops up in modern films here and there. In Japan, it’s an active genre for manga and anime. But in the U.S., it’s all but extinct (at least on its own). 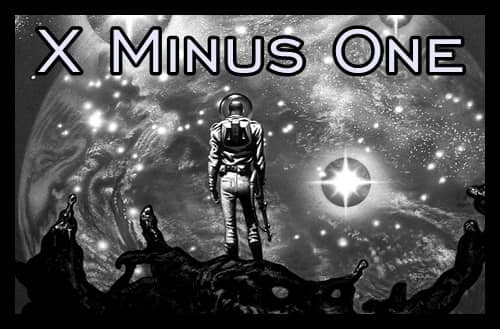 This story is a combination of sports and science fiction, so if you’re looking for a fix on sports short fiction or just want to give it a try, see if you can track this one down. I think it’s fairly entertaining. “Chain of Command” by Stephen Arr — George and Clara are mice living in a power plant, and the janitor places traps outside their hole. Clara is concerned their children will accidentally injure themselves and asks that George do something about it. One of George’s ancestors was exposed to radiation, leading to a lineage of intelligent mice. So George begins a conversation with the janitor about the traps. The janitor defers the decision to his supervisors, leading George on a long trail of requests to protect his family. I found this lighthearted mouse tale (or is it tail?) made me smile more than once. I can tell that Arr wants the reader to have fun with him, and he succeeds. 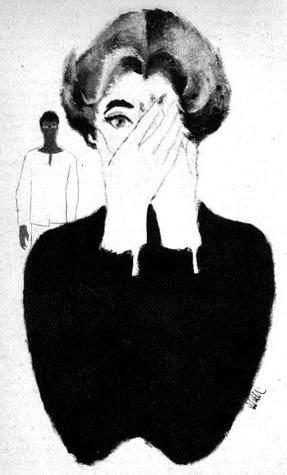 This story was also adapted for radio’s X Minus One in 1956. “Bedside Manner” by William Morrison — Fred and Margaret, a married couple, are the only ones aboard their ship when it collides with an asteroid. 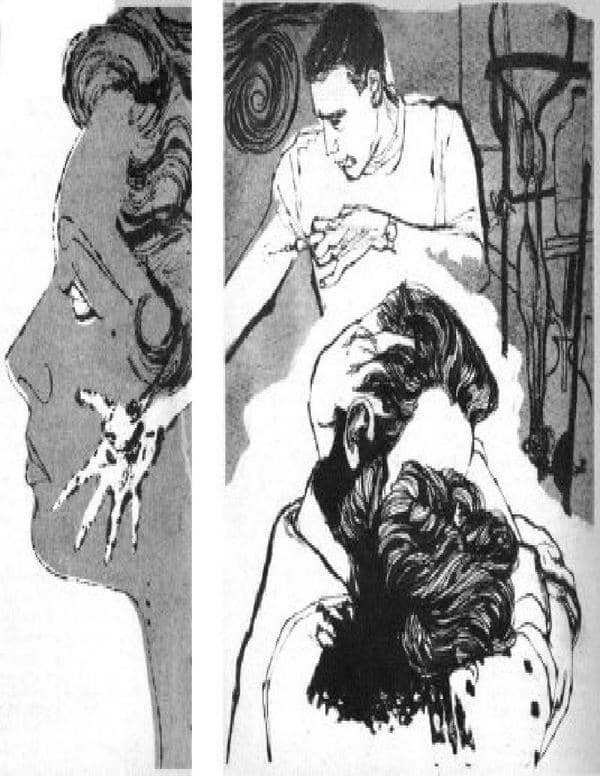 Margaret awakes without any of her senses or appendages. An alien tells her that it managed to save her and her husband but that it must reconstruct their bodies. It’s a chilling thought, considering that the alien has limited knowledge of humans. This story could have gone in a thousand directions. Will the couple end up as monsters, will they trade places, etc.? I kept bracing for a twist ending that never transpired. I suppose there is a slight twist, which is a bit of a relief. I think my anticipation of a larger twist kept me from enjoying the story as much as I should. Maybe that’s my fault, or maybe I’ve been trained to expect twists in stories like this with Galaxy. Regardless, if you read this story, just enjoy it for what it is and don’t worry about any twists. Morrison was a pseudonym for Joseph Samachson, who began his career as a research chemist (he had a Ph.D. in chemistry from Yale). In addition to his short fiction, he also worked as a writer for DC Comics, contributing stories for multiple characters, including Batman. 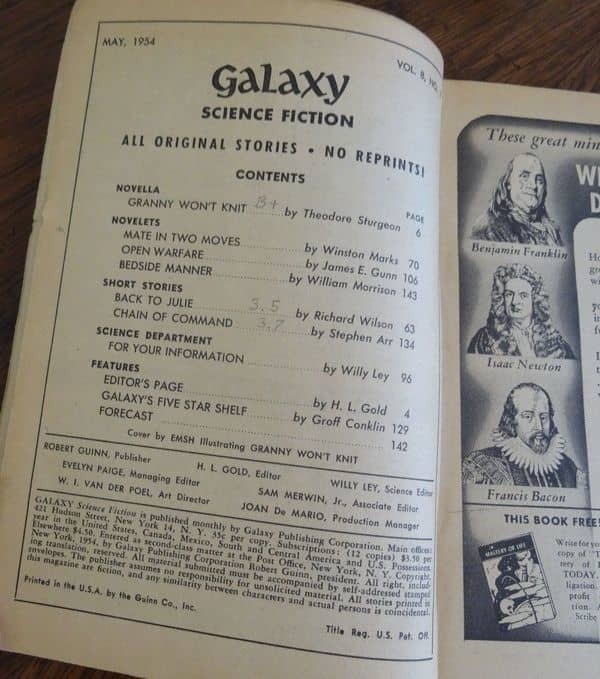 Matthew Wuertz’s project to review every issue of Galaxy magazine began with the January 1950 issue. See all his reviews here. 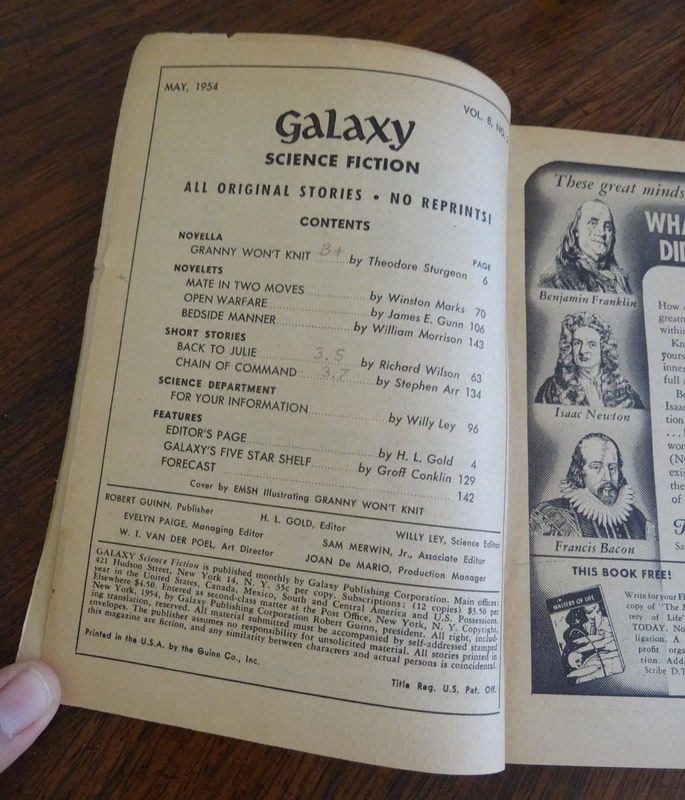 Major Wootton, I typically review the fiction and omit anything else. But I’ll consider mentioning the features in future articles. 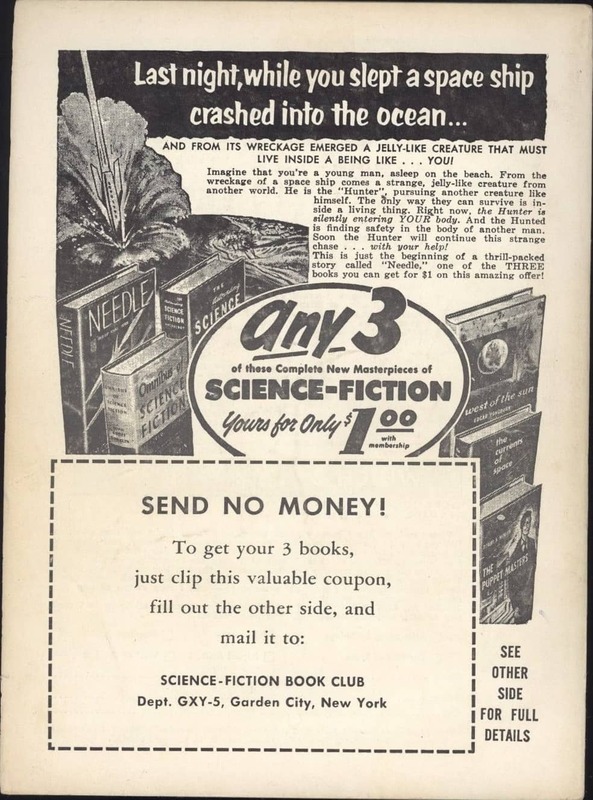 The issues always include a science article and book reviews. What I want to know is how a magazine like this could afford to pay Benjamin Franklin, Isaac Newton, and Francis Bacon to write for it. An excellent review! It turns out that Gunn’s story “Open Warfare” also has an X Minus One episode. Worth listening to for the snappy dialogue alone! Thanks, Matthew, for considering having some comments on the features as well as the stories. I like knowing, too, if there’s anything of interest in the letters pages of the mags (such as Fantastic) that did include letters. 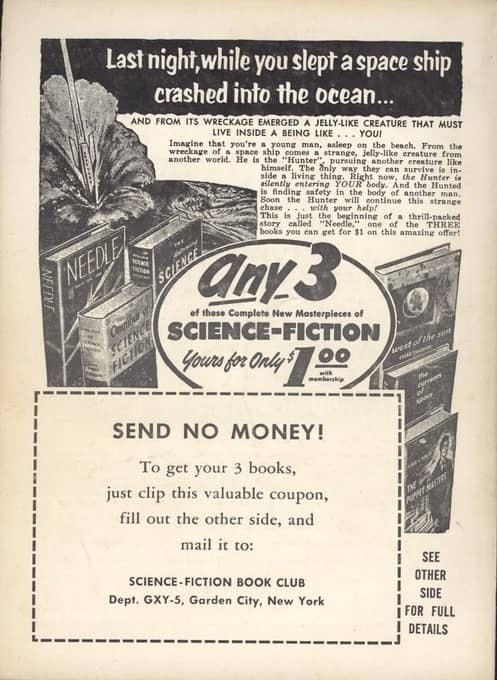 One issue of Fantastic, for example, had a letter from M. Moorcock about Mervyn Peake — this at a time when the Gormenghast books hadn’t been paperbacked yet, at least in the US. It’s interesting to get glimpses of such things. Adrian, thanks for the link!